Answer: EarPlanes consist of two elements: a hypoallergenic silicone ear plug and a ceramic pressure regulator. The silicone earplug has four circumferential rings which provide an airtight seal between the product and ear canal. The ceramic element is a controlled porosity filter, one end of which is exposed to the external cabin pressure, with the opposite end exposed to the sealed chamber formed when the ear plug is inserted in the ear. Thus, as the cabin air pressure changes, a pressure differential is created across the ceramic filter, thereby causing air to flow through the filter. The filter acts as an impedance to the flow of air into and out of the ear canal. Discomfort is caused by blockage and/or swelling of a passengers Eustachian tube(s). The air pressure changes induced by the aircraft's descent are too rapid for the blocked Eustachian tubes to adjust properly. However, EarPlanes, provide an equal but opposite impedance on the exterior of the middle ear, allowing relief. Discomfort is reduced because the air pressure difference on the exterior and interior of the middle ear is lessened allowing the Eustachian tubes to function more normally. Answer: EarPlanes are intended for people with sensitive ears or people who must fly even though suffering with a cold, allergy or sinus condition. A pediatric version is available for children 1 to 11 years of age. Are there any other benefits to EarPlanes? Answer: EarPlanes also act as noise suppression ear plugs. Many users report that EarPlanes seem to filter out much of the objectionable high frequency noise generated by aircraft engines. Most importantly though, airline flight safety announcements may still be heard (and headsets worn) by users. Answer: During operation, air flows through the microscopic pores of the ceramic filter. Particles of smoke, pollen, airborne bacteria and earwax are small enough to eventually "clog" the filter and reduce effectiveness. Where can I find EarPlanes? Answer: EarPlanes and Children's EarPlanes are available at all independent and local Pharmacies, Clicks, Pick and Pay, Spar and Medirite Pharmacies. Answer: Take a decongestant 24 hours before flying to keep air passages and ears clear. Chew gum or drink fluids through altitude changes during flight to equalize the pressure in the middle ear. Use a set of EarPlanes™ for take-offs and landings or altitude changes during the flight to equalize the pressure in the middle ear. Hold the nose and swallow to alleviate ear pressure in the middle ear. Use ¼ percent Neo-Synephrine nasal spray shortly after boarding the aircraft and again 45 minutes before the aircraft is due to land to keep the nasal passages open. Answer: EarPlanes come in two sizes- one for adults 12 and over and Children’s EarPlanes for children 1-11 or people with smaller ears. What are BioEars used for? Answer: Helps to prevent Swimmer's Ear by keeping water out of the ears. Are BioEars safe for children? Answer: Yes, BioEars is safe for everyone including children. Do BioEars provide good protection from noise? Answer: Yes, BioEars has a noise protection rating of 22 which is equal to most Soft silicone earplugs. Can I use BioEars for swimming? Answer: Yes, BioEars is waterproof and may help to prevent Swimmers Ear. Where can I buy BioEars? Answer: The ear care section of Pharmacies and on this website. June 12, 2001, NEW YORK – Ask many air travelers and they’d agree: they’d rather roll about in a field of cactus than place themselves in the care of a major air carrier. Between the delays, the lost luggage and the no-star dining, there are a lot of reasons why the flying public is disenchanted. Among the most distressing, according to a recent survey: being seated in the vicinity of a child or infant, or worse yet, being that child’s parent. A recent nationwide survey conducted online by Harris Interactive for EarPlanes reveals that nearly one out of three people have serious misgivings about being seated next to kids on an airplane. Twenty-five percent of respondents said that they’d feel “apprehensive” about the “crying and flailing” of young children, while seven percent said they would go so far as to try to change seats. Even the parents themselves are leery of boarding airplanes with little ones. In fact, one-third (34%) of parents with children under 10 admit that they “dread” flying with their own kids. Whether it’s brother and sister pulling each other’s hair, snack deprivation or the resounding cry of “mommy my ears hurt,” parents can have a tough time keeping children happy and comfortable. One serious problem that often leads to children loudly “verbalizing” their displeasure with flying is ear pain during take-off and landing. The major reason for this: take-offs and landings cause unequal pressure between the cabin and the child’s inner ear, which can be excruciatingly painful. And while adults may not be as quick as kids to let others know it, they can experience this problem too, especially when suffering from colds or allergies. 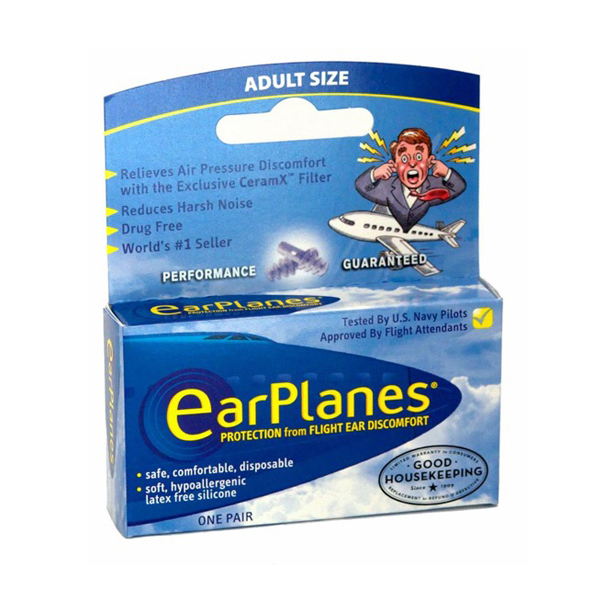 EarPlanes are patented earplugs designed to combat in-flight ear pain. By regulating the pressure difference between the inner ear and the cabin, they help both children and adults feel more comfortable. With EarPlanes in place, aviators of all ages can enjoy air travel that’s pain and aggravation-free, at least until the galley runs out of coffee…or scotch.